For the first time, a U.S. drone struck Pakistan outside its lawless border area with Afghanistan, killing the leader of the Afghan Taliban in the country’s southwestern province of Baluchistan. Pakistan, Somalia, Yemen — the United States has not hesitated to target terrorist targets when and where it deems fit. In Pakistan alone, the U.S. has carried out 391 air strikes since 2008, according to The Long War Journal. In Yemen, U.S. strikes targeting al-Qaida commanders total 145 since 2002. The figures are based on press reports. Human rights groups have long called for hard numbers when it comes to counterterrorism strikes that until recently the administration refused to even confirm. “Saying ‘just trust us, we have high standards, we are doing the best we can’ really isn’t enough and that they need to be disclosing more,” said Rita Siemion of Human Rights First. Volunteers stand near the wreckage of a destroyed vehicle, in which Mullah Akhtar Mansour was allegedly traveling in the Ahmed Wal area in Baluchistan province of Pakistan, near the Afghanistan border, May 21, 2016. The Obama administration has promised as much — with a soon-to-be released report outlining the number of combatants and civilians killed in U.S. drone strikes since 2009, outside of areas of active hostilities, like Iraq, Afghanistan and Syria. What the administration will release remains to be seen, rights groups say lump sum totals of civilians and combatants killed in the last seven years will not do a great deal to increase transparency. The many critics of the policy say that instead, White House officials should outline how they collected data, and how they define terms like combatant, imminent threat and feasibility of capture, while taking further steps to formalize U.S. drone policy. “All of the work they [the administration] has done over the years, to set standards, to set boundaries, they need to codify that into an order so that Obama does not leave as his legacy a sort of boundless, endless forever war,” Human Rights First’s Siemion noted. Still, the deployment of drones, particularly this most recent strike against Afghan Taliban leader Mullah Akhtar Mansoor is perplexing to some. “The U.S. provides so much funding to Pakistan though USAID and development funds. But then it does something [like this] that scuttles all that effort,” Islamabad resident Hina Ahmed said. Still others question how the administration determines where it can engage. “We [U.S. forces] are not allowed to aggressively move against the Taliban [in Afghanistan], yet now they are going and bombing and violating Pakistan’s sovereignty, and taking a shot at the Taliban leadership inside of Pakistan, it’s a curious kind of decision-making,” according to Foundation for Defense of Democracies’ Senior Counselor John Hannah. 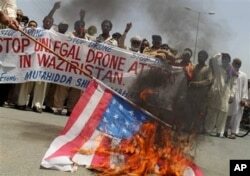 Pakistanis in the Waziristan region protest drone strikes in the border regions of Pakistan, May 30, 2013. Hannah served as senior adviser in the Clinton administration and the George W. Bush administration, which attracted its own criticism for the creation of Guantanamo Bay military prison. Still, Hannah says drone strikes are an effective tactic in countries like Yemen and Pakistan, where the government is either unwilling or unable to go after terrorists — while minimizing civilian casualties — compared to conventional military conflict. The key, Hannah says, is creating the necessary institutions and safeguards to create accountability, while balancing national security, transparency, and rule of law. VOA's Ayesha Tanzeem contributed to this report. 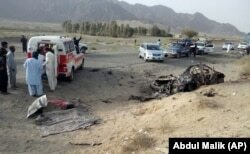 Who Gave Info that Led to Drone Strike on Taliban Leader?